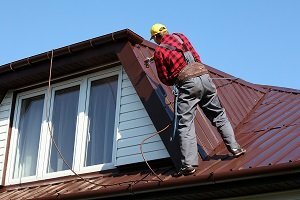 When you are faced with household projects, you want the quickest way to get the paint job done. Using rollers and paint brushes will not get you the fastest results. It is time to invest in a quality airless paint sprayer. The Graco Brand is one that you’ve probably heard rave reviews about and for good reason. Read through these Graco Magnum Pro x7 Airless Paint Sprayer reviews and you will be painting like a professional in no time. Why Choose a Graco x7 Airless Paint Sprayer? Graco has become a leader in the paint sprayer industry. Since 1926, they’ve been leading the pack in innovation and technology. In fact, over 85% of professional painters trust Graco sprayers with their projects. The Project Series sprayers from Graco make it easier for DIY homeowners and handymen to accomplish mid-size jobs with speed and accuracy. The high-pressure pumps deliver a finely atomized spray for a professional finish. Complete your tasks at a fraction of the time in comparison to choosing traditional brushes and rollers. By using an airless sprayer, you have the opportunity to pump paint and other materials at a very high pressure. This can be done up to 3,000 PSI. The materials will be pushed out through a tiny hole in the spray gun’s tip. When that occurs, the paint breaks up evenly into a fan-shaped spray pattern made up of tiny droplets. The Graco Magnum Pro x7 series provides 10% more output than the Magnum X7. This series is available on wheels to make transport easy. This allows you to take the paint sprayer anywhere, for any project that needs to be done. The Graco Magnum Pro x7 is the last Graco model available before you make your way into their professional line. All Graco paint sprayers allow you to spray directly from a 1 or 5-gallon paint can to make spraying easier and faster. In addition, they offer the unique PowerFlush adapter which allows you to hook a garden hose to the unit for quick cleanup. The possibilities for using this paint sprayer are nearly endless. The Graco Magnum Pro x7 series was designed with the remodeler, property owner or maintenance professional in mind. This is ideally for someone that paints on a regular basis. As a homeowner, you can use it indoors or outdoors. It will work well on the house, fence or deck. As a property manager, you will have the ability to lower your costs by doing projects yourself. There will be no more need to call in professional painters when something needs a touch-up. This will also work for the contractor or professional who needs a paint sprayer occasionally. This isn’t designed to be used commercially on a daily basis. Remodeling a house will also be a cinch with this airless paint sprayer. You can effectively spray a wide variety of coatings. Use it for stains to heavy latex and acrylics. The only items you’ll want to avoid using this sprayer for are solvent-based lacquer, block filler, asphalt and texture-filled materials. Due to the flexibility and portability of this unit, as well as the ease of cleanup, you can pull this sprayer out even for your smaller projects. It would still save you time over using the traditional rollers and paint brushes. 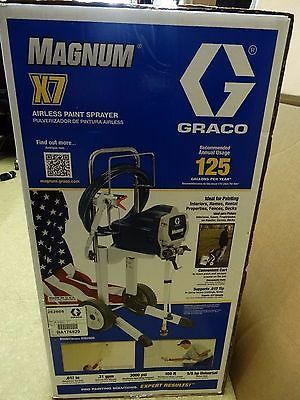 Now it is time to take a look at the Graco Magnum Pro x7 Airless Paint Sprayer reviews so you can find the sprayer that is right for you. This Graco sprayer has been replaced by a newer model but is still one of the most sought after paint sprayers. It offers 0.34-gallons per minute of spraying power. Like all Graco models, this can also pump directly from your 1 or 5-gallon paint container making it easier than ever to complete your projects. The maximum operating pressure is 3000 PSI and the maximum tip size on this model is 0.017-inch. It offers ¾-horsepower and runs off your standard 15-amp household current or 1500-watt generator. You can use a hose up to 150-feet long so you can easily reach any project with ease. It is capable of spraying a wide variety of coatings. Use it for your stains, heavy latex or acrylic materials. This x7 has a fully adjustable pressure control to allow you the flexibility for any paint flow during any project. You will be able to spray your materials unthinned with the Stainless Steel Piston Pump. Again, you can spray directly from your 1 or 5-gallon paint bucket. The recommendation on this unit is up to 125 gallons per year. The RAC IV SwitchTip will allow you to reverse the tip when it gets clogged. That helps you to save time and get the job done faster. In addition, you will be able to use the unique PowerFlush Adapter offered by Graco to connect your garden hose to the unit for quick cleanup. These are very similar machines. Although as I will continue to explain, they do have a few subtle differences. Both of these units have been leaders in the market. They both offer many features of the unique Graco technology like the ability to pump directly from the 1 or 5-gallon paint container and the PowerFlush Adapter for quick cleanup. Both of these models are also designed for more usage than a typical household paint sprayer. They will be good to use on remodeling projects or for property management needs. In addition, they come with the RAV IV SwitchTip which many other top brands don’t offer. This tip will allow you to reverse it when a clog occurs. You’ll no longer have to stop and remove the clog to keep spraying. This is an immense time saver when attempting to complete a job. One of the biggest differences between these two paint sprayers and others on the market is the price. You are going to pay slightly more to own a Graco airless paint sprayer. You do get what you pay for and will find that these models outlast most other brands on the market. If you can afford to purchase the better brand, you will want to. It will save you from many headaches, and broken parts in the future. There are also several differences between the two Graco models themselves. For example, the Pro X7 has double the annual recommended usage than the x7 model. If you are going to be painting regularly, you will want the one that can be used more. In addition to that, the Pro version comes with 50-feet of hose and that can be extended to 150-feet of hose. The x7 model only comes with 25-feet of hose and will only allow extension up to 100-feet of hose. This is going to be a big difference if you are hoping to work further from the unit. Finally, you’ll also notice that the Pro x7 has a ¾-horsepower motor while the x7 only features the 5/8-horsepower motor. In comparison, however, there is only a 0.03-gallon per minute difference in how much paint it can spray. You can also find out the differences between the x7 and the x5 models here. When you are ready to take on those household projects, you know that a Graco Airless paint sprayer is the way to go. It will provide you with a professional finish at a fraction of the time. The only thing left to do is decide which model is going to suit your needs the best.